jahboater wrote: The Pi3 when running in 64-bit mode will have available a 113-bit mantissa giving 34.016 digits. ??? Where is this 128bit floating point support? Yes it has 128bit NEON registers but that ranges from a 16x 8bit vector to a 2x 64bit vector. AFAIK it isn't a single 128bit value for anything other than load/store. If you use "long double" in C you automatically get 64-bit reals in 32-bit mode (same as double), and 128-bit reals in 64-bit mode. Underneath its the _Float128 type. There is also _Complex128 to go with it. Apparently 64-bit hardware/OS are needed to implement it at a decent speed. Just use "-lm" no special libraries are needed. long double is 128 bits. Sadly I don't have a Pi to hand to test on. Last edited by Heater on Thu Dec 15, 2016 4:14 pm, edited 1 time in total. long double is 96 bits. long double is 64 bits. edit to add the 128-bit system ends the same 833 - the Pi ending is different. Sadly "long double" on Intel/amd gets you the 80-bit x87 reals. To get 128 bit reals on Intel 64-bit you have to use "_Float128" which is a real pain (and libquadmath https://gcc.gnu.org/onlinedocs/libquadmath/). A good value to print is LDBL_DIG for the actual precision in decimal digits, its 18 on Intel and 33 on 64-bit arm (and 15 for DBL_DIG). Note sizeof() tells you nothing much. On Intel 32 bit sizeof(long double) returns 12 and on 64-bit sizeof(long double) returns 16. They are both 80-bits taking 10 bytes, so there are some unused bytes. This is because the ABI needs 80-bit reals on 16 byte boundaries for 64-bit mode. to print to the maximum reasonable precision. Last edited by jahboater on Thu Dec 15, 2016 4:35 pm, edited 4 times in total. Been interesting reading stuff I don't know about . What about GPU (videocore wrt R-Pi) targeted code? Your Pi is running a 32-bit OS where "long double" is the same as "double". You need to run a 64-bit OS for long double to be truly 128-bits. I told you it was a right PITA. I gave up and only use the ARM "long double" implementation because its so easy and portable. On arm its all transparent - just use long double and it all works. sqrtl() and suffix L (= 2.0L) just as normal. That all works too on Intel for 80-bits. For _Float128 on Intel, the suffix is Q . So you need sqrtq() and probably "= 2.0Q". You will also need quadmath_snprintf() to print the result. Told you it was a pain. Is it available for C++ ? if you cant get it to work, try C.
Last edited by jahboater on Thu Dec 15, 2016 5:10 pm, edited 1 time in total. Ah, thanks. I already had the quadmath_snprintf() in the above example. Forgot to change sqrtq() to sqrtl() though. The range by the way is 10e +/- 4932. So factorial 1754 is possible, compared to factorial 170 which is the best 64-bit doubles can do. Yes but I was hoping that as we know the result we want we could set up and exact equality. Yes but I was hoping that as we know the result we want we could set up an exact equality. But for the test anything after about 34 places will be ignored. It shows how one can side step the problem of number representation by not actually returning a number as a result! No, 1/3 most certainly is a number. It's an exact rational number, to be precise. Scheme provides for (at least) several numeric types : Complex numbers, reals, rationals, and integers. There are no theoretical limits to these; integers can have an arbitrary number of bits, as can reals (floating or fixed point numbers). There's also the concept of exactness, which is orthogonal to numeric type. is, at least on the scheme implementations I have easy access to here, an inexact real, the result of multiplying the floating point result of (sqrt 2) by itself. However, an implementation might define (sqrt 2) as an exact "symbolic" number, and thus the result might well be an exact integer, as it should be. It rather depends on how mathematically correct you want to be. My main gripe with "machine numbers" as handled by most languages isn't mathematical completeness, however - it's that they usually have no indication of exactness, and usually very little handling of the oddball edge cases. No, the copy of Chez I was using doesn't run on the Pi (although it's been open sourced, https://github.com/cisco/ChezScheme, and has ARM support, so it should be relatively trivial to build it, in as much as building a scheme system is ever trivial), but most of the other schemes build for ARM too. The only one I have on this machine that treats 1/3 as 0.333333… (which isn't incorrect, just - unexpected) is chicken. tufty wrote: My main gripe with "machine numbers" as handled by most languages isn't mathematical completeness, however - it's that they usually have no indication of exactness, and usually very little handling of the oddball edge cases. I'm not quite sure what you mean, but in C yes exactness is hard to deal with. 1.0/3.0 will of course raise FE_INEXACT which is fine. But so will things like log10(100), cbrt(27), log2(2), pow(4.0,0.5) because internally they might raise FE_INEXACT even though the result is definitely exact. On the other hand sqrt(4.0) will not because it will use a single hardware instruction which will always set FE_INEXACT correctly. And then sqrt(2) * 0.0 will raise FE_INEXACT because the flag is sticky. Another difficulty: things like strtod( "0.3333333333333333333333333333333333333333" ) are happy even though some digits have been discarded. Yes, very hard to deal with. jahboater wrote: Yes, very hard to deal with. But... computers are always right! Well, exactness is one thing, it's hairy and nasty and not helped by floating point. I read a very good paper on hardware accelerated ULP based representations, which allow one to keep a handle on the current (potential) inexactitude in a computation. As per usual, I've lost the link. It's horribly inconsistent. And so we end up with programs that break when compiled on different platforms, or using a different compiler, or without some special incantation of compiler flags. Given that computers are supposed to be deterministic calculating machines, it seems insane to me that we leave much of calculating down to little more than luck. You can just do your best, make sure there is absolutely no UB in your program - but how many programmers fully understand aliasing, overflow rules etc etc. Not many I suspect. Even worse is the behaviour of compilers that assume overflow cannot happen in a correct program and do strange optimizations based on that. 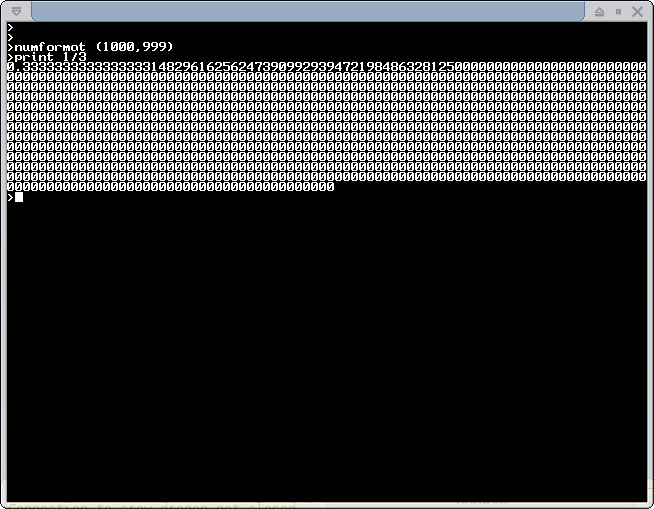 -fwrapv makes signed integer overflow defined by the way. Wow, lots of interesting debate here. Which I will have to think about after some sleep. For many things I am happy with the crude data types of C.
However, it's very annoying that so much of that is "implementation dependent". That means you can never be sure your program works on all compilers and architectures. WTF? I also find it insane that C will happily overflow an integer or whatever, produce an undefined result and then happily continue producing garbage. They tried to fix that kind of problem with Ada. But it seems programmers roundly rejected the idea of such a "fussy" system. I'd disagree about the edge cases. For the intended audience — general engineering computation — IEEE 754 does a remarkably good job of hiding the limitations inherent in trying to wedge the representation of a real number into a limited number of binary bits. It does so fairly quickly, and without needing acres of silicon. While there is a real science to knowing when you shouldn't be using it, 754 has brought reliable FP with well understood, reliable limitations to the masses. If you even know what Scheme is, you're pretty much not the intended user. If you want to see bad floating point, look to the implementations in the BASICs of many 1980s microcomputers; edge cases a go-go! I really must do something with the stick of AMD 4-bit ALUs I picked up surplus. That's some real adding up right there! Basically looks the same, but significantly faster, 29 seconds for 10M, still including compile and function call overhead. I'm sure we can do better than that. fxdiv, for example, is number-theoretically correct. But as we're dividing an integer that is known to be positive and by a power of two, we can just bitshift it. And we're down to 8 seconds. The calling code, FWIW, looks like this, and uses fixnum operations throughout. It's ugly and I could do a lot better if I could be bothered. At this point, memoising could be a good next step. We have fixnum vectors, so why not? This will, of course, push a lot of overhead onto the vector manipulation code, it might not work. Unfortunately, I have a lot of stuff to do and only one day off, so it will have to wait. Yep. It actually need 36 digits after the point to pass. Anyway, I give up with that float128 thing. 1/3 most certainly is a number. It's an exact rational number, to be precise. Problem is you can't map "1/3" onto reality without more work. Namely a division. For example how are you going plot 1/3 on the number line? Or how are you going to output it to some actuator? Now, where is that scheme version of the collatz algorithm? You mean those AMD 29K bit slice ALUs? Awesome, how did you get hold of those? Heater wrote: Problem is you can't map "1/3" onto reality without more work. Namely a division. Keeping things exact until it's absolutely necessary to approximate them is good practice if you care about the correctness of your result. Perhaps my bias, which comes from, amongst other things, a mixture of financials and airworthiness, shows here. Heater wrote: For example how are you going plot 1/3 on the number line? I'd put it as close to exactly one third of the way from zero to one as I could. Heater wrote: Or how are you going to output it to some actuator? Also, 2901s? If so, make yourself an Atari vector machine!